Nowadays, beauty salon service is more and more popular all around the world. more and more people start to Take care of himself appearance. when you walked into the shopping center or bustling commercial street. you will notice there are many salon services is coming now. such as manicure, pedicure, eyebrow threading, hairdressing, teeth whitening. cosmetic, massage, skin care and more. In this article what I wanna share is some very exquisite cosmetic store projects for your meet. it’s very worth a look If you’re planning on starting your own business. At first, what I wanna introduce is one attractive mall cosmetic kiosk. the whole shop mainly tone is brown and white. it mainly for selling skin care product. you can see the whole kiosk four sides with Ladder to show, acrylic plate inside hidden led light, at each display counter surface with many acrylic decoration plates, top part add led light strip, looks very eye-catching. You will notice the whole kiosk corner have a big decoration pillar. because there has an original pillar. it’s very nice to support the whole roof. you can see we also add more images wall and display cabinet on there. In the middle of this kiosk have two makeup table with mirror and beauty lamps. Guests can try on their makeup here, I have to say the whole design is very high-end and comfortable. The second style I wanna share is a very exquisite make-up store. we choose reserved black as the whole store mainly tone. match a little white countertop and decorative tile wall. looks very high-end and elegant. 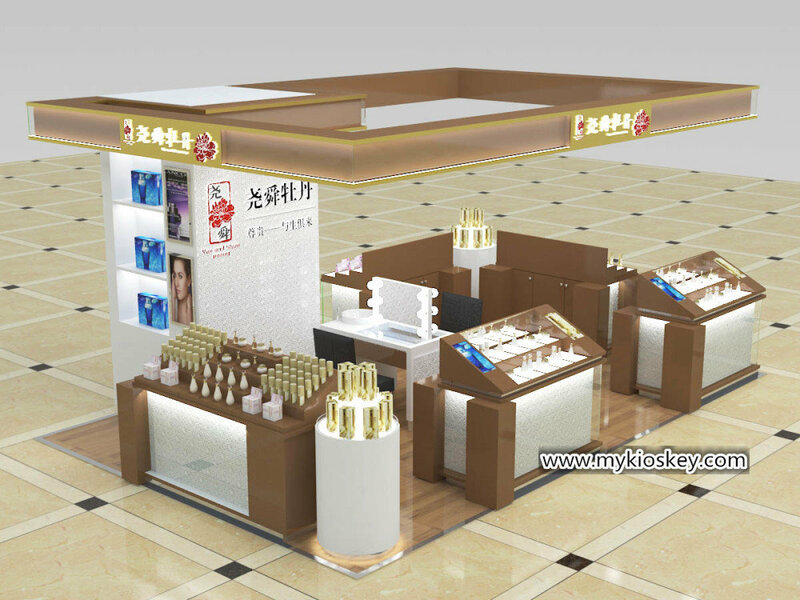 in the store middle is a long beauty bar, have six make-up stations with mirror and bar chair, on the whole kiosk two sides is 1.5m height cosmetic display shelves, the bottom is some black wooden cabinet for storage, at the top part is white tile decoration wall. put some lightbox here, it’s very attractive. In order to match the whole store styles, you will notice the whole store ceiling install many small spotlights, tint wood grain floor at below. looks very comfortable. 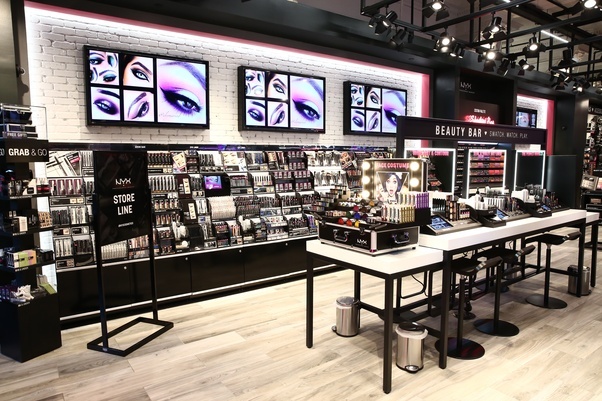 The third one is a make-up station, it can locate in a cosmetic store or shopping center, it mainly for lipstick and eye black, the whole bar mainly tone is white, match two black strips, you can see the whole showcase is a slant. Covered with an acrylic engraving, Each hole and square is laser engraved exactly to the size of the lipstick box, you can see the whole showcase is very tidy and beautiful. At the whole countertop is a big poster, match some spotlight, at the counter bottom also with white led light strip, looks very bright and attractive. 1. a wide range of consumer groups. 2. low cost, high profit. 3. easy to operate and high plasticity. 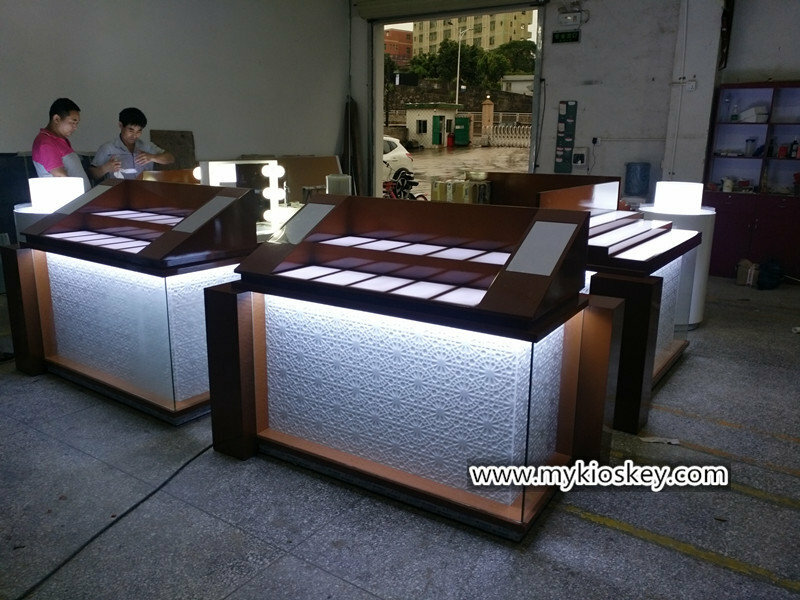 Thanks for your time and reading, hope this article is helpful for your business, unique kiosk as a direct manufacturer, we mainly work on the design and customized different types of the retail kiosk and display fixtures. if you’re interested start your own cosmetic shop. also can direct contact us here. welcome inquiry! PreviousPrevious post:Modern and luxury Watch kiosk design shared with youNextNext post:How to customize a suited eyebrow threading kiosk?